Beijing time on October 18, qualcomm in Hong Kong’s 4G / 5G summit repeating Snapdragon 653, Snapdragon 626 and Snapdragon 427 three processors, corresponding price is $300 + respectively, 150 – $250 and $100. According to official introduction, newly released three new processor support the CAT.7 X9 LTE standard (descending rate of 300 MBPS, 150 MBPS uplink rate) and qualcomm Quick Charge 3.0 technology, charging efficiency is 4 times of that of the traditional charging mode. In addition, support for dual cameras have also expanded from Snapdragon series 800 to 600 and 400 series Snapdragons. 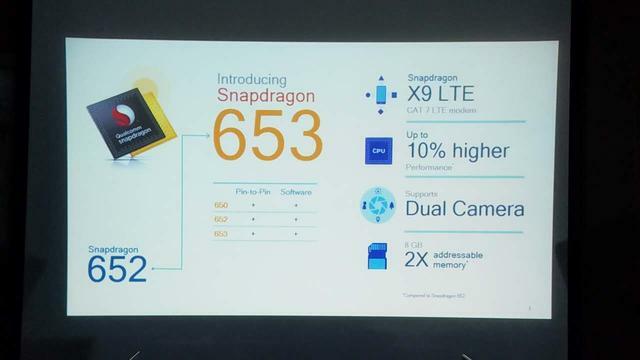 Snapdragon 653 location is the successor Snapdragon 652, 28 nm process, pin and software compatible with Snapdragons 625, maximum support 8 gb of memory, dual cameras and QHD screen resolution, the fourth quarter of this year the commercial. 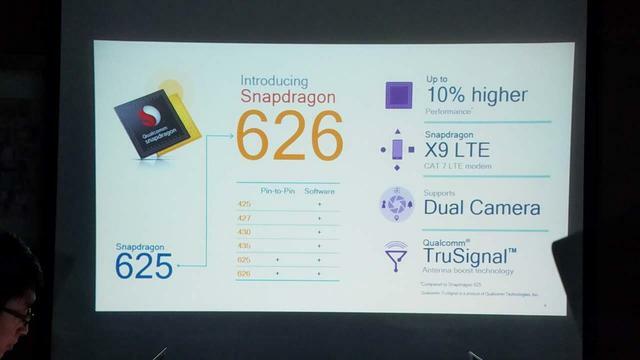 Snapdragon 626 belong to Snapdragons 625’s successor, 14 nm process, pin and software compatible with Snapdragons625 , Snapdragon 425/427 425/427 processor software compatible, comprehensive performance increase 10% CPU, while supporting dual cameras, qualcomm TruSignal antenna enhancement technique and FHD screen resolution, is also the fourth quarter of this year the commercial. 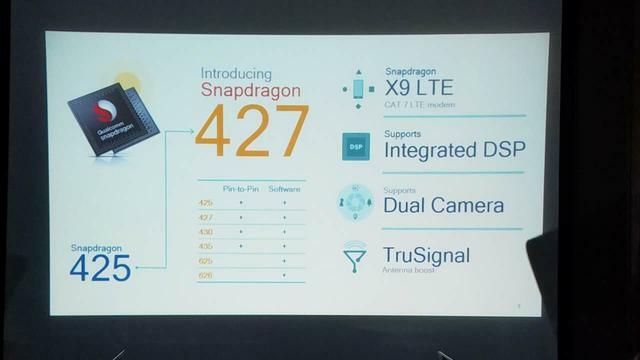 Snapdragon 427 for Snapdragon 425 extend, 28 nm process, with Snapdragon 425/430/435 pin and software compatibility, and software is compatible with Snapdragon 625 and 626, and was the first TruSignal introduced Snapdragon 400 series processor chips, in the first quarter of 2017 the commercial. 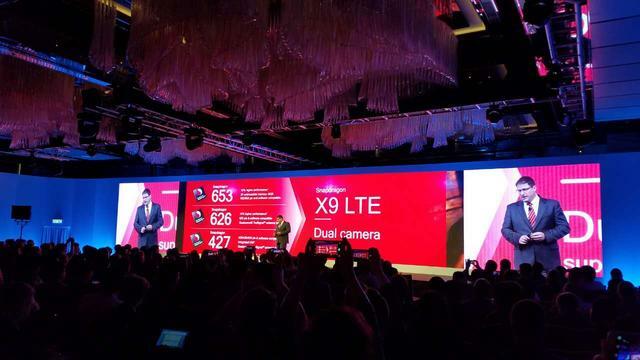 compared to Snapdragon 653, Snapdragon 653 and Snapdragon 427 one thousand yuan machine market positioning very grab an eye, and the market was dominated by mediatek scheme for a long time in the past, the new processors at will to cell phone manufacturers more diversified choice, before this, there is news that samsung will meet Snapdragon series 400, one thousand yuan machine market. In addition, qualcomm also announced over the past 12 months, the world has more than 400 Snapdragon 600 series chipset based OEM terminal design, there are more than 300 models have been published, there are more than 100 models are currently developing.